After ribbing Metallica earlier in the month over the suspiciously familiar artistic direction of their new Hardwired...To Self-Destruct, New Orleans sludge greats Crowbar have now announced a forthcoming full-length of their own. Titled The Serpent Only Lies, the band's 11th studio LP is due October 28 via eOne Music. 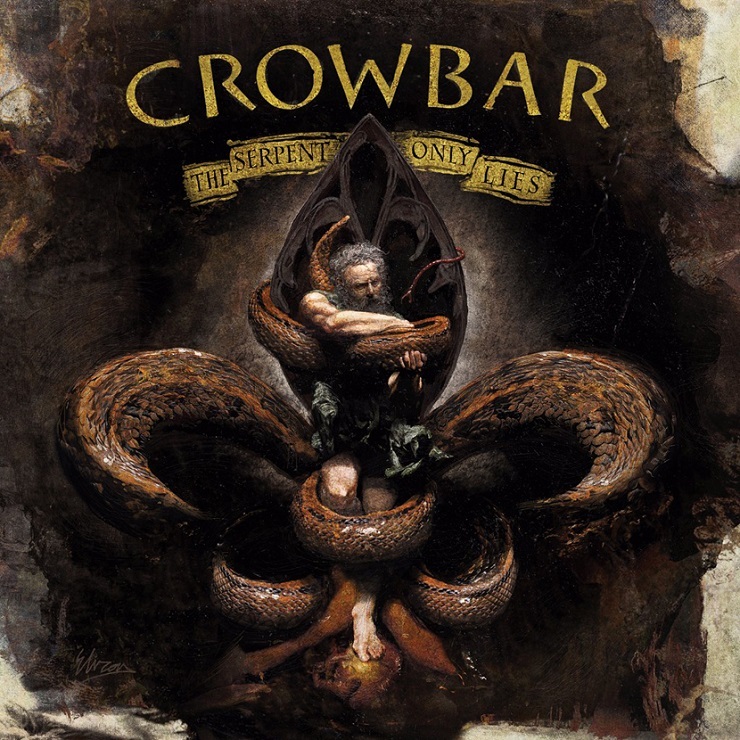 The record follows Crowbar's Symmetry in Black release from 2014 and likewise alludes to the group's NOLA heritage by employing a fleur-de-lis in its artwork. This time, as you can see, the familiar shape is presented in the guise of a slithering snake wrapping itself around a human. The piece was done by artist Eliran Kantor (Hatebreed, Kataklysm). On the musical front, vocalist/guitarist Kirk Windstein said that he looked to his past for inspiration this time around, from his band's early '90s output to a few old favourites that helped shape the sound of Crowbar. "I intentionally went back and listened to a lot of old Crowbar stuff, like the self-titled and Broken Glass albums, to get a feel for what my mindset was 20-plus years ago," he explained in a statement. "I also went back and listened to the bands that influenced Crowbar in the beginning, like Trouble, Saint Vitus, Melvins, and the first Type O Negative record. So it was kinda me doing my homework." Windstein added that "some of the songs have less lyrics to let the riffs breathe a little more," an approach also inspired by Crowbar's early days. While a full song stream has yet to arrive, a detuned and slowly slammed preview of the new record's doom-and-gloom can be heard in an album teaser down below. The current lineup is Windstein, drummer Tommy Buckley, guitarist Matt Brunson and original bassist Todd Strange, who had left the band in 1999. Windstein explained of being reunited with the founding member: "It's a great feeling to be standing onstage next to him." Crowbar are gearing up for a series of U.S. and European dates between September and November. You'll find the show schedule over here.